Pet Naturals of Vermont is a leader in high quality nutrition for animal health in USA with 30 years experience, manufacturing supplements. The R&D is headed by Dr Roger Kendall who is also the chairman of the scientific advisory committee at the National Animal Supplement Council (NASC). The NASC seal displayed on all packaging is the guarantee that the product meets the NASC guidelines for quality, integrity & truth in labelling. NASC works closely with the AAFCO (Association of American Feed Control Officials) and the FDA for product regulation issues. Check out the various methods of nutrition delivery by Pet Naturals, all tasty. 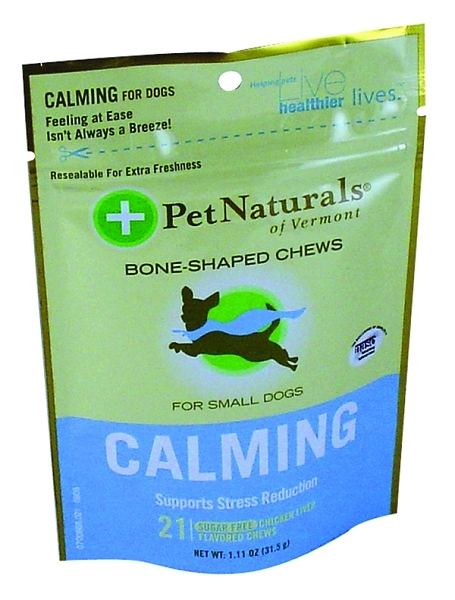 Calming for Small Dogs is a soft chew supplement with high-potency natural ingredients that are properly formulated for optimal results. It is especially good for situations like separation anxiety, thunderstorms, grooming / vet visits , moving , travelling or any stressful situation. It does not cause drowsiness. Your Pet stays alert but relaxed. Works in less than 20 mins and can be used daily or just when extra help is needed to relax. The active ingredients are Thiamine, [Vitamini B1], L-Theanine, and Colostrum Calming Complex [a substance found in human mother's milk]. Thiamine [ Vitamin B1 ] , L-Theanine , Colostrum Calming Complex , Canola Oil , Mixed tocopherols, Propprietary Blend [ maltodextrin , sodium alginate , calcium sulfate ] , rosemary extract , silicon dioxide , vegetable oil. Up to 25 lbs: Give 1 soft chew daily.